Transferable skills are skills developed in one job that you can take to another job. The transferable skills that you possess equip you to move to your next career opportunity, and they are the framework on which you build your career. Everyone has transferable skills; it's just a matter of identifying what they are and how they will fit into the role you are applying for. What transferable skills could you have? Identifying your transferable skills and communicating them in a written job application and an interview is incredibly powerful. It communicates to the selection panel that you have a clear understanding of the job you are applying for, what your skills are (i.e. what you can do), and what you can offer. When putting together this inventory, think in terms of “I have/I did”, “I can/I do”, or “I am”. It can be helpful to get a friend, family member or colleague involved in this exercise to help get your brainstorming going. It can be quite a fun and enlightening process. Looking at your current or old job descriptions or duty statements are also good places to gather information. Below is also a list of accomplishments to get you started. How do your transferable skills fit into the role you are applying for? This is the harder part of the process of identifying and communicating your transferable skills. It requires a good hard look at the job description and probably also a discussion with the contact officer. 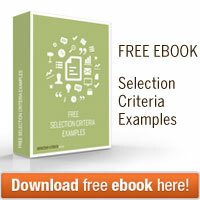 When it comes to writing your selection criteria you can make clear comparisons to what is required in the job and what you can offer. Even stating "I have clear transferable skills in this area as evidenced by..." to make it very explicit.